Santa Fe City Hall is located at 200 Lincoln Avenue, Santa Fe, NM 87501; phone: 505-955-6611. 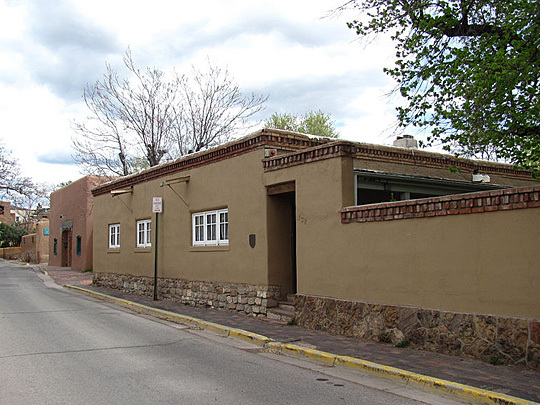 Photo: Gregorio Crespin house 132 East De Vargas Street, Santa Fe. In 1693, a Tlascala Indian received a grant for the land on which the Gregorio Crespin House sits. Tree-ring samples obtained from the vigas in the house indicate a cutting date for the tree of between 1720 and 1750, while the first existing title transfer on the house was filed in 1747. Originally of Spanish Pueblo design, this one-story house with its thick adobe walls, five rooms, a covered veranda, and a patio, later had Territorial embellishments added to its trim along the roofline. Photograph by John Phelan, 2010, (own work) [cc-by-3.0 (http://creativecommons.org/licenses/by/3.0)], via Wikimedia Commons, accessed September, 2012. Santa Fe, capital of New Mexico, started life in 1609 with the florid title of the Royal City of the Holy Faith of Saint Francis—La Villa Real de la Santa Fe de San Francisco. It has been a capital continuously for more than 300 years, and the flags of four nations—Spain, Mexico, the Confederacy, and the United States—have flown over its ancient Palace of Governors, a building which still stands along the north side of the plaza and whose history is the history of Santa Fe and New Mexico. It is the oldest capital within the boundaries of the United States. Never an industrial city, and even now 16 miles from the main line of the railroad, Santa Fe nestles in a little valley of the Rito de Santa Fe where it emerges from the foothills of the Sangre de Cristo Mountains to the east. To the south are the Sandia Mountains; in the west is the Jemez Range. Surround by those snow-covered mountain peaks, in a land of vast distances and deep colors, this spot, from ancient times, has been a magnet for travelers. Today its major industry is the tourist and vacation trade. The summer nights are cool, and in winter, the noon hours are warm. Snow lies on the high mountain peaks of the Sangre de Cristo until late June. In July the summer rains bring mountain freshness to the valley. The charm of the Royal city is quickly felt. The ancient narrow streets and the brown adobe houses are thick with deeds and memories. In the evening the fragrance of pinon smoke fills the air, for Santa Fe is a city of fireplaces. It is a town of patios where hollyhocks nod, where towering cottonwoods spatter with shade, here a crumbling gateway, there an ancient wall whose adobe bricks show through the broken earthen plates. From the eminence of a nearby hill is visible, sun-washed in the daylight, thick on the floor of the valley and scattering to the foothills, clusters of flat, rectangular adobe houses along winding roads; and in the center of town, above the roof tops and the occasional smokestacks and the arms of the cottonwoods, the glistening dome of the State capital. From the same hill at night the town's glimmering lights are a handful of stars flung across the valley. Santa Fe has seen much history in its crooked streets and venerable plaza; it has seen wars and rebellions, Catholic feasts and devout processions; Spanish men-at-arms, soldiers of Mexico, the Confederacy and the Union; bull-whackers and caravans of the Santa Fe Trail; Spanish Women in black shawls, and the Indians from the nearby pueblos wrapped in blankets; for here are blended, as nowhere else in the United States, the full rich patterns of three distinct cultures—Indian, Spanish and American. The settlement was founded in the winter of 1609-1610 by Don Pedro de Peralta, third governor of the Province of Nuevo Mejico, at a spot known to the Pueblo Indians as Kuapoga, or the place of the shell beads near the water." Ruins, almost obliterated when the Spaniards came, showed that it was once the site of a Tano Indian village. Today's dwellers, in digging foundations for their homes, frequently unearth remnants of the prehistoric past in the form of pottery fragments, implements and human bones. When Peralta came to Santa Fe, he built the palacio for a fortress, laid out the plaza, and planned a walled city. At various places today the ruins of the ancient wall may still be seen. In the Palace, built the year the town was founded, sixty Spanish governors ruled the vast territory over a period of 212 years, and maintained the Spanish borderlands against invasion from the north. From the time of its founding to the present day, the town has been a continuous seat of government. Works Progress Administration, Federal Writers' Program, New Mexico: A Guide to the Colorful State, Coronado Cuarto Centennial Commission, 1940.